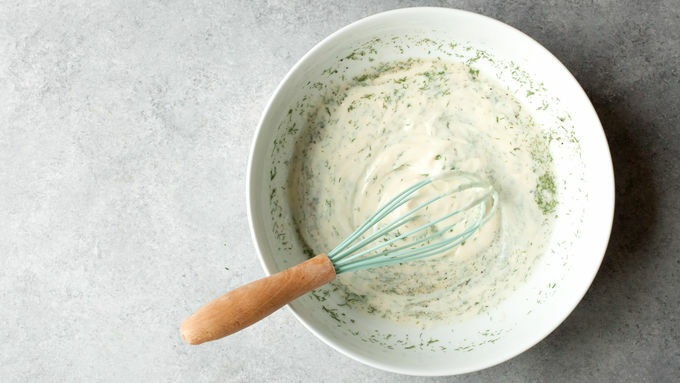 In a large bowl, whisk together the yogurt, dill, garlic powder, lemon juice, vinegar, sugar, salt and pepper. Add in the cucumbers and onions, and toss to coat. Taste for seasoning, adding more salt and pepper if necessary. Refrigerate for at least 10 minutes before serving. Yields about 1 cup per serving. Feel free to sub in Greek yogurt if that’s what you have—just replace half of the vinegar with milk. For a prettier salad, run a fork down the side of your cucumbers before slicing—it’ll make nice little ridges in the slices that look beautiful and hold onto the dressing. The longer this rests in the fridge, the tamer the bite of the red onions gets. 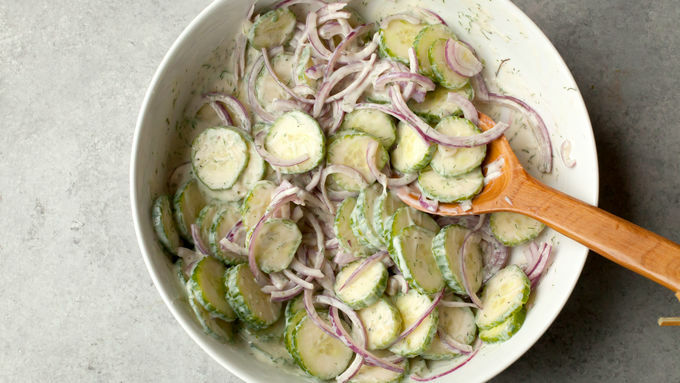 If you could hop in a time machine and travel back to my kitchen table during summers when I was a kid, you’d probably find this Creamy Cucumber and Red Onion Yogurt Salad (or as we simply called it, “Cucumbers and Onions”) on the table. Like most of the best food in the world, it’s gloriously simple—and tastes way better than you’d think it would based on the short ingredient list. The key to the great flavor? Fresh cucumbers and onions. 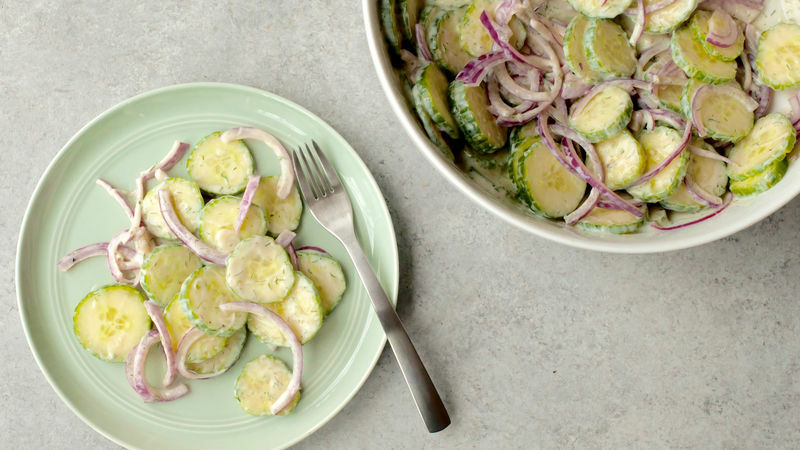 This salad is perfect for when cucumbers are growing by the bushel-load over summertime. (Seriously, check your farmer’s market; by the time mid-summer rolls around, they might pay you to take some.) This side dish is cool, creamy, and the perfect way to balance out the smoky flavor of grilled food. You can also spiralize or very thinly slice the cucumbers and onions and make it into a slaw that is great on top of pulled pork!